Follow in the foot steps of Sweden's biggest ever popband! Come on, let's go! The ABBA Guide to Stockholm is the first book of its kind, taking you to more than 60 important ABBA places in and around Stockholm. ABBA used their home town regularly as a backdrop for their record covers, music videos and dozens of photo-shoots. Find out where the famous park bench photo was taken, scenes from "ABBA – The Movie" were filmed and where ABBA recorded their world-famous music. 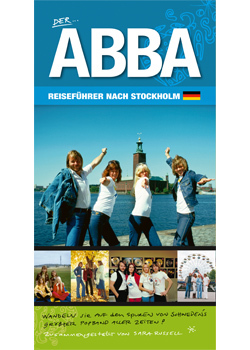 This handy book will also guide you to Stockholm’s biggest tourist attractions and many popular entertainment venues, like Kungliga Slottet, Stadshuset, Gröna Lund, Konserthuset and the Hard Rock Café – all places that played a significant role in ABBA's career. The ABBA Guide to Stockholm contains hundreds of photos, all the addresses and transport information you will need, and of course a map of Stockholm and its surrounding area!